The i200 was produced from 1985 to 1986 and was launched as a limited edition Group B FISA homologated model by Opel tuning and styling house, Irmscher. It was based around the GT/E coupe but featured many subtle changes. Manta 400 Rally car quad Halogen headlamps and a deep boot spoiler were added along with many mechanical upgrades. The standard package included a high lift cam, solid lifters, uprated valve springs and re-mapped distributor to increase power output by some 15 bhp. UK specification cars were generally fitted with a gas flowed cylinder head which gave the i200 136 bhp. Many other options were available such as a big valve head and Limited Slip Differential. As the car was usually built to order, the specification was dictated by how much could be spent. A new cloth trim was introduced, with the Recaro seats being decorated in black 'Opel Sport' cloth. Similar to the Road Manta/Ascona 400 seats with Black seat backs, the i200 version had grey, lightening the interior. The Blitz interior is the biggest clue as to the whether the car is an original. Many 'look alike' models appeared but did not feature the mechanical modifications. A 'no cost option' was the fitment of a Rothmans decal set, to celebrate their sponsorship of the Dealer Opel team. A limited edition Opel Sport version of the decal kei was also released but it is the Rothmans Blue / Red / Gold striping kit that most people associate with the car. As the i200 was fitted with Quad Headlamps from new, the headlamp wash wipe was not applicable and as such the front airdam was not fitted with washer jets. The chassis build plate should also show the factory code for the Blitz Trim interior (188) and not the code for the other variants of trim available. The model code for the GT/E, which surprisingly was XR3, is not present on the genuine i200 build plate. 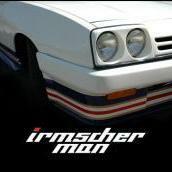 It was possible to have a standard GT/E converted to i200 specification by purchasing the upgrade kit from Irmscher. Several of these conversions are know to the club. They do not feature the Blitz interior however, as this was made in very small numbers and was not available as an aftermarket item. The i200 was only in production for 2 years and only sold in relatively small numbers from the UK Irmscher franchise, Steve Thompson Cars Ltd, of Walsall. It is believed that 30-35 i200's were built, all of which were Coupe's although there are rumours that a Hatchback version exists. Less than 20 examples survive making this a rare and collectable edition.